Most potential audience members of “The Book of Mormon” have assumptions before setting foot in the theatre. 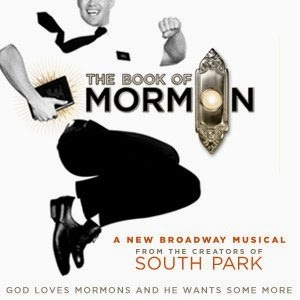 Solely based on the playbill’s credits -- the team that founded “South Park” is the same who created “Mormon” -- expectations include: hold no one or anything sacred, lambaste all ethnicities, demean sexual orientation, and ‘crucify’ every religion. Okay, then why see such rubbish? The answer to that question is the same to...why does “South Park’s” 15 year run continue? The answer -- it’s funny, very funny. Good clean fun, it’s not. It’s the funny stuff that you wouldn’t dare say yourself or perhaps admit to enjoying. The stage is essentially populated by white boys in white short-sleeved shirts whose sacred chanting of “I Am Africa” is utterly ridiculous, and motley dressed black Ugandans whose rendition of Mormon history is a hoot. In the midst of this R-rated story, is perhaps surprisingly some beautiful music. Taking the notes by themselves, “Baptist Me” and “I Believe” are lovely pieces. But, alas, the salacious lyrics outnumber the music in importance. That seems to have been the creators’ plan for their audiences -- don’t leave the theatre humming, leave the theatre laughing. Each Act has its show-stopper. In Act I, the rockin’ “Man Up” praises “The Man” Jesus. The deep red special effects and nefarious dancing historical characters of “Spooky Mormon Hell Dream” justifiably stop Act II. “The Book of Mormon” boasts a young and energetic cast blasphemously opening the pages of this wonderfully campy and hokey script for an appreciative audience that willingly lets raucous humor trump divinity for at least two hours. It is difficult to imagine a more professional, deftly executed, swift paced, colorfully designed, and creatively choreographed musical on a Broadway stage.